Enjoy some FREE TIME to relax after your journey and to embrace the past and the present, as you get caught up in this town’s captivating history. The city dates back to the Umbrian and Etruscan civilizations and there is so much to admire. Take a stroll around its steep alleys and stairways, (before you meet your guide tomorrow). Take in the fascinating highlights, like San Lorenzo Cathedral, Palazzo Priori and the National Gallery, which houses some of the most important and complete collections of 13th to 16th century Umbrian Paintings in Italy. It won't be long before you'll be tempted by the little cafes and restaurants which spill out onto the sidewalks and tempt with the aromas of Umbria's wonderful cuisine. These food specialities are to be savoured slowly in the wonderful historical Piazzas such as the Piazza IV Novembre with its Fountain. Whatever your preference you will find plenty to do here. Our TOUR VOUCHER will give you lots of ideas of what to do, see and taste before you meet up with your guide tomorrow. 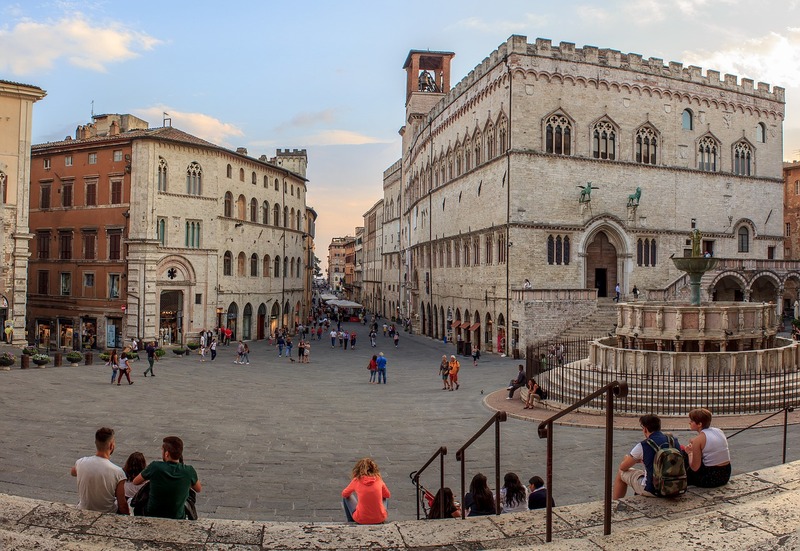 After breakfast in the Hotel, meet up with your friendly guide who will lead you on a journey through centuries past as you discover the ancient parts of Perugia, taking you back over 2000 years to the glories of the Etruscan Era. Your English speaking guide will make the stories of Umbria your stories by sharing the quirky tales of past and present. Have no fear, this is no history lesson but more like Juicy Gossip! Yes... it is easy to go into art and history overload as the town is full of such amazing stories, but just enjoy and take in as much as you can this time round. Besides art and history a good way to understanding the real Umbrian lifestyle is through food and of course wines! As in ancient times... the locals still live to eat and drink, so while you walk around the old town don’t forget to ask your guide about the small grocery shops and the old wine bars. At the end of the tour you will enjoy some true local specialties at a typical, small "osteria." Perugia's cuisine is a delightful fusion of many years of local tradition and cuisines from across the the region. It makes Perugia a real treat for the taste-buds. Umbria also signifies great wine! If you want to start living like the Italians, you are certainly in the right region. Umbria’s unique landscape has made it an ideal vine-growing region since antiquity. It now has an international reputation that allows them to compete with other labels from around Italy. The region’s vine-growing traditions and secrets are jealously guarded and passed down through the centuries. They have ensured that a startling variety of unique Umbrian grape varieties – both red and white – have survived. Some prime examples are Ciliegiolo, Sangiovese and Sagrantino, as well as Drupeggio, Grechetto, Malvasia, Procanico, Trebbiano and Verdello. The careful blending of these local vines with other varieties has produced quality results. Your host at the winery will be only too happy to answer your queries and curiosities about how the rolling hills and different climate pockets of this area have enabled producers to grow a broad variety of vines, from traditional ones to the newer varieties. After your tour you will be taken back to Perugia. Your guide will suggest an amazing trattoria for dinner but, before you go to dinner, head off and enjoy an aperitivo in one of Perugia’s famous piazzas. After breakfast meet up with your private English speaking driver. Today, while you continue discovering the region's wines, you will have a chance to enjoy magnificent Umbrian scenery as we head towards Lake Trasimeno, which is the largest lake in central Italy. The shores of this picturesque lake are surrounded by rolling green hills. On its coastline you'll find lovely small medieval towns like Passignano, San Feliciano, Corciano and others. The largest town, Castiglione del Lago, has a lovely beach and is built on a small promontory, with Etruscan and Roman remains nearby. There is also an austere Medieval Castle, contested by the lords of the time and still surrounded by a fine circle of walls and fortified towers. With the backdrop of this enticing setting you will be hosted by two different wineries. 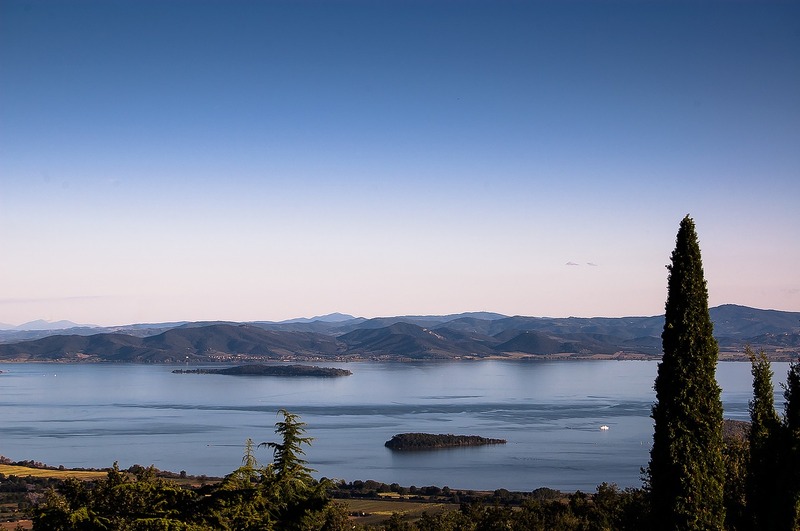 You'll hear all about the Trasimeno Hills which enable producers to grow a broad variety of grapes: from traditional varieties such as Sangiovese, Grechetto, Trebbiano, Canaiolo and Malvasia to more well-known wines like Cabernet, Pinot Bianco, Pinot Grigio, Merlot and Chardonnay. Throughout this entire area lay the medieval estates of the Knights of Malta and the landscapes used by Perugino for his paintings of great fortresses and abbeys. Another prominent feature of the green hills of Umbria are the olive groves. The very long lived, but slow growing olive truly represents this region’s long history. Extra virgin olive oil is produced in five municipalities and we can arrange for you to explore along “The DOP Olive Oil Road” during your trip to the lake. Tasting olive oil might not sound great but once you've tasted THIS olive oil you'll change your mind. Time permitting, we'll enjoy a tasty stop at one of the local cheese factories to sample local Umbrian cheeses like the Pecorino of Norcia and the local version of Ricotta. Breakfast at the Hotel and meet up with your driver for your tour around yet another enchanting area of Umbria. Described by connoisseurs as the “green heart of Italy”, this area of Umbria is known for its lush vegetation and heritage-rich Medieval hamlets. The trail today will certainly help you appreciate this part of Umbria: You will discover wonderful castles and medieval hill-top villages, each remarkable for their historical and artistic heritage. In this seemingly sleepy countryside you'll love the pictureque scenery of vineyards clinging to hills as you travel along scenic roads. The principle places are: Gualdo Cattaneo – Bevagna – Montefalco – Giano dell’Umbria – Castel Ritaldi – Bettona – Cannara. You will visit two different wineries where you can chat about this now world famous wine region. Here, generations have worked the soil over many centuries to bring us the treasures we take for granted when we pop open a bottle of vino! In the cellars we'll also enjoy a wine tasting of the “Sagrantino DOCG", while being surrounded by breathtaking vineyards, where lovingly preserved, centuries-old traditions, are handed down from one generation to the next and where you can admire magnificent views too. In between the two visits we'll enjoy a traditional Umbrian lunch. While we are here a visit to Montefalco is a must. 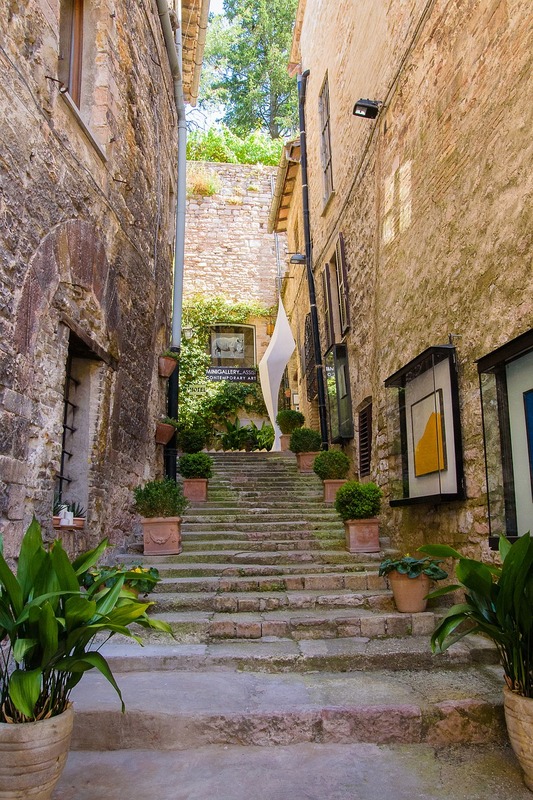 Known as “The Ballustrade of Umbria”, thanks to its charming position and its artistic treasure, it is truly one of the most delightful towns in Umbria: housing within its churches splendid paintings and frescoes of the 14th & 15th century. Breakfast at the hotel. Private transfer to the Perugina Casa del Cioccolato in Perugia, a must-do on the list of Umbrian discoveries. You will visit the museum which includes a visit to the Perugina factory where guests can view chocolate production. Also included is a taste of the company’s most popular chocolates. Afternoon transfer to your hotel in Assisi. Breakfast at the hotel. Then you will join a local chef for a medieval cooking class in Assisi, and prepare a menu that’s straight from the convents, hermitages, and monasteries of the Middle Ages. 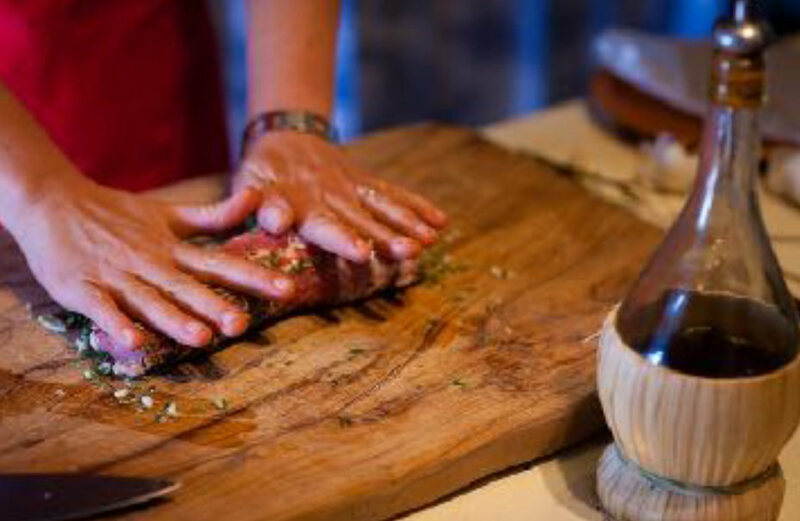 You’ll get hands-on experience making each dish and enjoy a historic lunch alongside a sampling of Italian wines, then bring home a book of unique recipes. This 4-hour Assisi cooking class includes lunch, a souvenir apron, a recipe book and locally-produced wine. 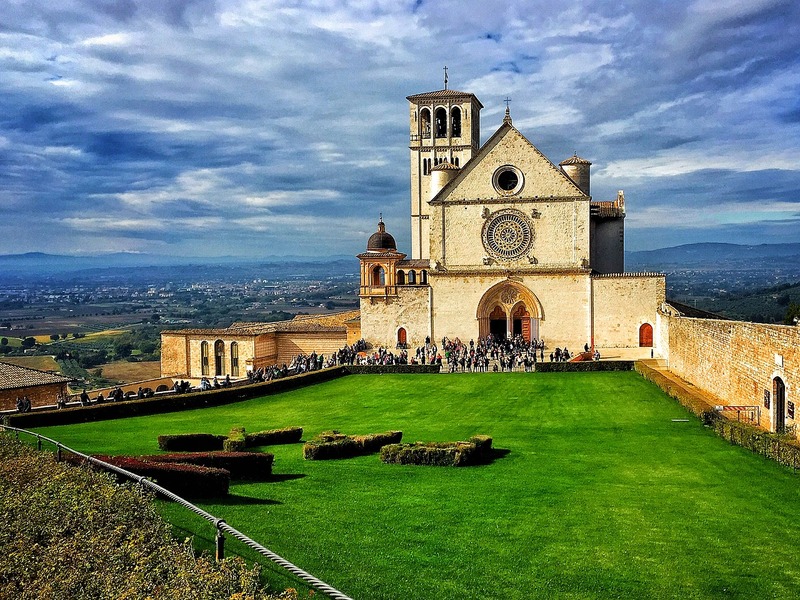 After this delightfull experience, you will be ready to see the highlights of Assisi on a 3- hour walking tour with a knowledgeable local guide. Learn the importance of the Basilica di San Francesco, a UNESCO World Heritage Site. Strolling through narrow alleys and medieval squares you will reach Saint Rufino’s Cathedral and Saint Claire's Basilica. From there, you will get to the main city square, Piazza del Comune. At the square you will see one of the best-preserved Roman temples in Italy – Minerva's Temple – which is surrounded by imposing medieval government buildings. Walk back to the hotel. Overnight in Assisi. After breakfast check out from your hotel in Perugia and meet up with your private English speaking driver who will be accompanying you to Rome Airport to catch your flight home. We are sure you will take back many wonderful memories of your time in Italy and we hope to see you again very soon for another enjoyable “taste” of Italy. Interested in our "Secret Italy" Tour of Umbria? Contact us! I understand that you will use my information to send me details of tours available.